Do you remember back in the dark ages when not everyone had cable TV and shows weren’t available to watch online? How did they get TV back then? It was broadcast over the airwaves and picked up by an antenna hooked to your TV. Turns out you can still do this today! A majority of the channels are available in HD too. There’s a good chance you can pick up ABC, NBC, CBS, FOX, PBS, and some other channels. With the advent of digital TV, stations are even able to broadcast subchannels. These are additional channels that come in the form of the channel followed by a decimal point and another number. The subchannels may carry local weather or programs that all have a similar topic (PBS does this). So, what do you need to pick up these channels? You’ll need a TV capable of decoding the digital signal or a converter box. You’ll also need an antenna. Depending on where you’re located and how many channels you want to receive affects what kind of antenna you need. If you’re in a big city there’s a good chance you could get by with an indoor antenna that looks like the old rabbit ears. On the other hand if you’re further out you’ll need a larger antenna mounted outdoors. Before the digital conversion you had to have an antenna capable of receiving VHF (54-72Mhz and 174-216Mhz) and UHF (470-698Mhz) signals. After the conversion to digital most channels are in the UHF range though some may still be in the higher VHF range. How do you find out what’s around? The internet of course. A really good site is tvfool.com. If you go to the site you can enter your address and it’ll make the chart shown below for you. It’s called a radar chart and has some useful information in it. In the top left corner is the actual radar plot. You’re in the middle with North and South are at the top and bottom respectively. The lines indicate channels with the length and color indicating signal strength. The numbers are, as you might imagine, the virtual channels. This plot helps you aim your antenna. In my case I have a lot of strong signals coming from the West with some scattered ones coming from the North-East. On the right side, the table of data contains a lot of useful information. It is sorted by signal strength. The first column lists the stations call letter. The next two list the actual broadcast channel and the virtual channel. The virtual channel is what actually shows up on your TV. The first channel, ##.1, is the only one shown and there may be other subchannels available that are not listed. The next two columns are the important ones because they actually tell you your chances of recieving the station. They’re in decibels (dB) with the first signal column listing the Noise Margin and the second listing the Power. The Noise Margin is the strength of the signal at your location in decibels above the noise. It has to be adjusted for any gain increases of your antenna and loses that may be due to cable, splitters, walls, etc. After these adjustments are taken into account if the signal is above 0 dB you’ll probably be able to pick up the station. The higher the better of course. Power is the predicted signal power at your location which I find isn’t as useful as Noise Margin. The next four columns give info on how far away the transmitter is, the path the signal takes to you, and the azimuthal location of the transmitter. The table is also colored from top to bottom by your chance of receiving the signals. 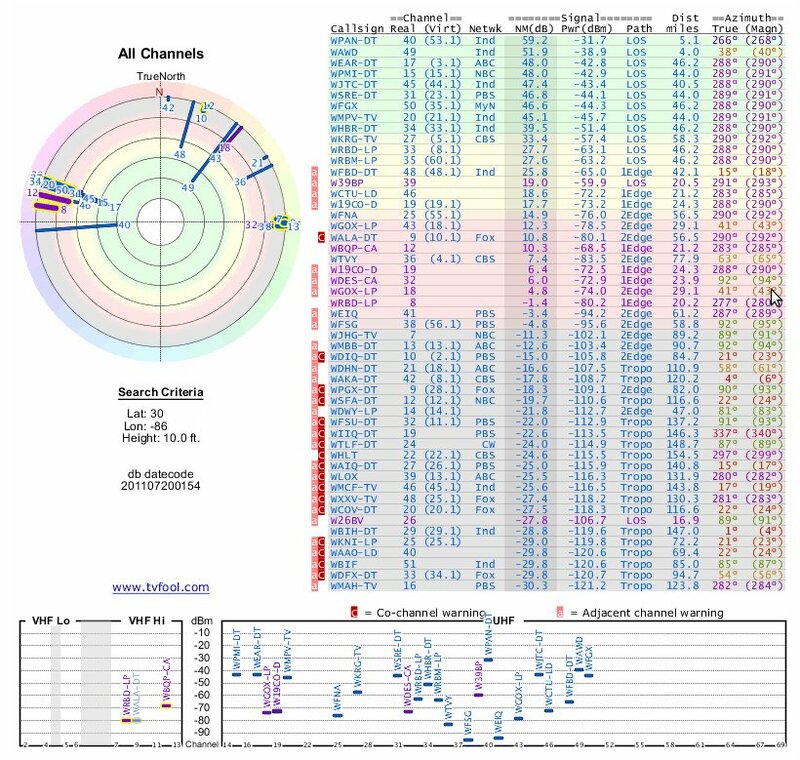 Green means an indoor antenna near your TV should be able to pick the station up, yellow requires an antenna in the attic, and red means you’ll need an outdoor antenna. Grey, on the other hand, means they’re out there but you’ll need to go above and beyond to pick the station up. More in depth descriptions can be found here. 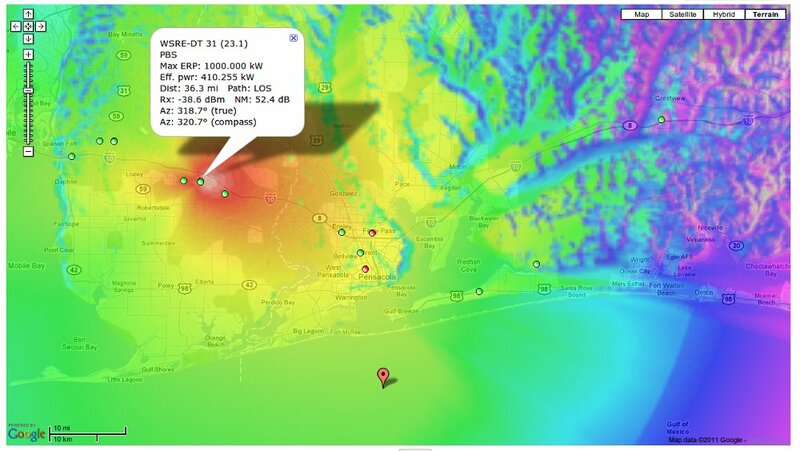 The bottom chart shows the locations of the stations broken into VHF and UHF sections. Another thing you can do on the site is look at the signal strength overlaid on a Google Maps image. You can click on different stations to get an image like the one shown below. This looks a little cooler but still has the same info as the chart from above. The color scheme is the same as the one for the radar chart table. This station’s tower is located between Mobile and Pensacola and broadcasts equally in all directions. Distance and terrain affects the signal strength. That’s a brief into to finding stations. Next up….antennas.